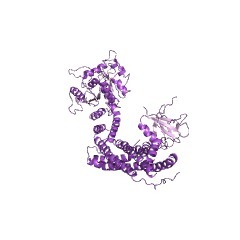 Dynamin GTPase effector domain found in proteins related to dynamin. Dynamin is a GTP-hydrolysing protein that is an essential participant in clathrin-mediated endocytosis by cells. 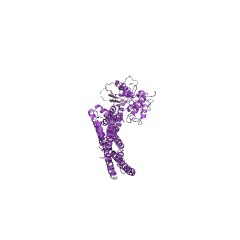 It self-assembles into 'collars' in vivo at the necks of invaginated coated pits; the self-assembly of dynamin being coordinated by the GTPase domain. 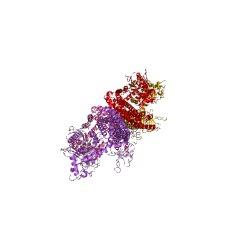 Mutation studies indicate that dynamin functions as a molecular regulator of receptor-mediated endocytosis [(PUBMED:10206643)]. There are 6230 GED domains in 6213 proteins in SMART's nrdb database. Taxonomic distribution of proteins containing GED domain. This tree includes only several representative species. The complete taxonomic breakdown of all proteins with GED domain is also avaliable. Click on the protein counts, or double click on taxonomic names to display all proteins containing GED domain in the selected taxonomic class. 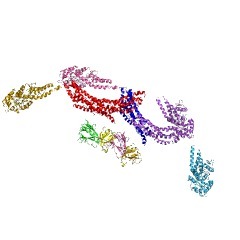 Impairment of dynamin's GAP domain stimulates receptor-mediated endocytosis. 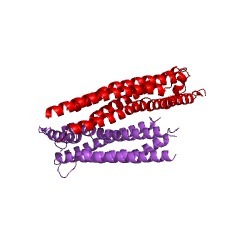 Dynamin is a GTP-hydrolysing protein that is an essential participant in clathrin-mediated endocytosis by cells. It self-assembles into 'collars' in vitro which also formin vivo at the necks of invaginated coated pits. 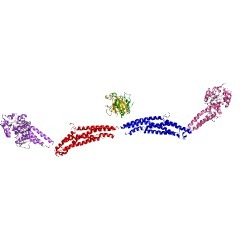 This self-assembly stimulates dynamin's GTPase activity and it has been proposed that dynamin hydrolyses GTP in order to generate the force needed to sever vesicles from the plasma membrane. 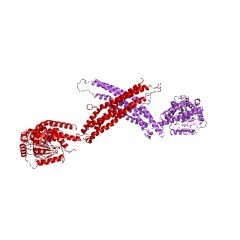 A mechanism is now described in which self-assembly of dynamin is coordinated by a domain of dynamin with a GTPase-activating function. Unexpectedly, when dynamin mutants defective in self-assembly-stimulated GTPase activity are overexpressed, receptor-mediated endocytosis is accelerated. 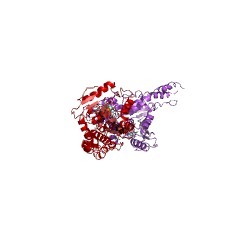 The results indicate that dynamin, like other members of the GTPase superfamily, functions as a molecular regulator in receptor-mediated endocytosis, rather than as a force-generating GTPase. 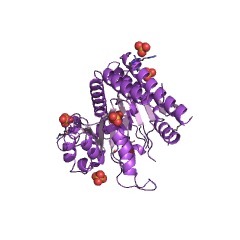 Domain structure and intramolecular regulation of dynamin GTPase. Dynamin is a 100 kDa GTPase required for receptor-mediated endocytosis, functioning as the key regulator of the late stages of clathrin-coated vesicle budding. It is specifically targeted to clathrin-coated pits where it self-assembles into 'collars' required for detachment of coated vesicles from the plasma membrane. 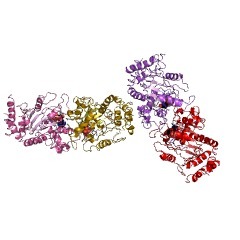 Self-assembly stimulates dynamin GTPase activity. 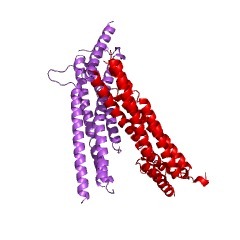 Thus, dynamin-dynamin interactions are critical in regulating its cellular function. 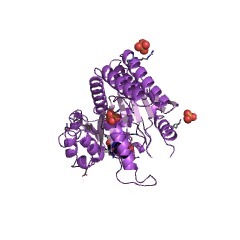 We show by crosslinking and analytical ultracentrifugation that dynamin is a tetramer. 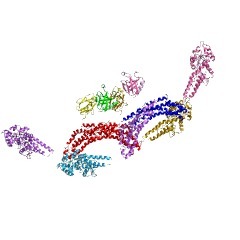 Using limited proteolysis, we have defined structural domains of dynamin and evaluated the domain interactions and requirements for self-assembly and GTP binding and hydrolysis. 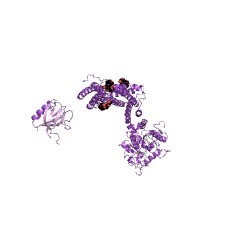 We show that dynamin's C-terminal proline- and arginine-rich domain (PRD) and dynamin's pleckstrin homology (PH) domain are, respectively, positive and negative regulators of self-assembly and GTP hydrolysis. Importantly, we have discovered that the alpha-helical domain interposed between the PH domain and the PRD interacts with the N-terminal GTPase domain to stimulate GTP hydrolysis. 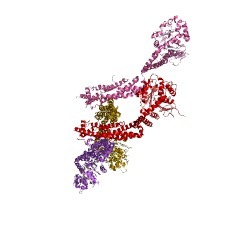 We term this region the GTPase effector domain (GED) of dynamin.